The dream is over … again. Following a group stage exit for Ingerland, there was no Eire faerytale finish for Tony Van Trapp’s over-achieving Oirish outfit in their Yooro 2012 table football tournament semi-final. Ireland finally got their come-uppance on Wednesday night at the hands of Joachi Lowenbrau’s Germany, the technic-proficient Germans on typically-top form as they progressed to the final after a 10-8 victory – taking their goals tally to 48 so far. But there was no hint of trouble between the opposing fans in Daftown, with reports of David Hasselhoff and Dubliners songs being played into the early hours as the party continued, with schadenfreude and shenanigans aplenty. Bad night: Eire’s Johnny St Patrick tries to look calm after his defensive mistake, while keeper Stray ‘Cat’ Gideon is clearly way off his line. There was also drama the following night as Polska followed Ireland home (apparently, their Daft Air charter flight was refuelling in Dublin), after something of a thrashing from Laurent Blancmange’s formidable French France side. In their rather bewildering post-semi-final press conferences, both Blancmange and Lowenbrau were quick to out-gloat and out-quote each other in a series of Cantona-style musings and pronouncements about their respective teams’ chances in the final. Blancmange chided that his strike force were ‘likely to make Black Forest gateaux out of their German opponents’ in Sunday’s big match if they continued their current hot form. But Lowenbrau bit back, saying at least that proved his side ‘are tasty’, adding that Blancmange had ‘more chance of pushing trifle up the Eiffel Tower than lifting any trophy at the New Table of Dreams’. However, the flamboyant French go into the final on the back of the only 100 per cent record in the tournament after five fine wins, following Thursday’s 10-3 semi-final thrashing of an off-form Polska side. That proved to be the second biggest win of the tournament, after Espana’s 10-2 humbling of the Croats in Group C, a tired Wyatt daughters’ pairing proving fatal as Franc Rubbery and Florentine Mangetout pulled the Poles apart – so to speak – much to the delight of watching YooArthur official and French legend Michel Platypus. 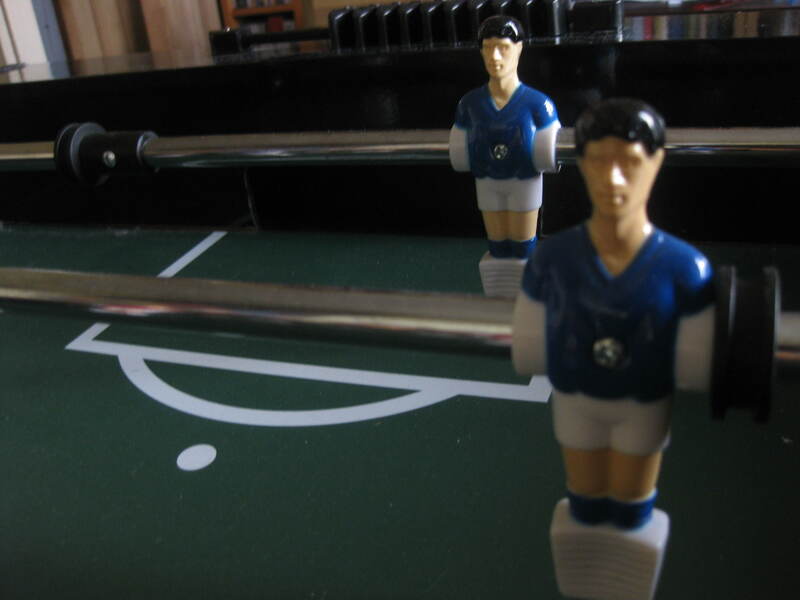 Matches 29 and 30 of the Yooro 2012 table football championships were -as ever -action-packed, and also ensured at least 500 goals in the tournament – even if we see a 10-1 drubbing in the final. That’s not likely, but it probably won’t rule out a busy Saturday at Daftown’s Ladsbroke, Yoobin Done and Bet Dave gambling emporiums before Sunday night’s final. In Wednesday’s nail-biter, early slapdash defending from Oirish quarter-final hero Johnny St Patrick and comical goalkeeping from Stray ‘Cat’ Gideon led to what proved an unassailable lead for Lowenbrau’s Deutsch Jungen, and despite a great comeback and two goals each for Bobby Keynote and Danny Duffy, it wasn’t long before Supermario Gomez and Messi Ozone had finished the job. It was far more emphatic the following night, on a night to forget for Polish keeper and one-hit wonder Gooner Szczesny Hawkes. But French France boss Blancmange will certainly have to do his devoir-scolaire if he is to successfully plot his team’s way past favourites Germany in the final. Yet he can take heart from the the fact that his French fancies are the tournament’s top scorers so far, having amassed a scintillating cinquante goals so far from their five matches. And whatever the likely outcome, the New Table of Dreams’ stage is certainly set for what promises to be a memorable final. Results: Group A – Poland 10 Greece 6; Russia 7 Czech Republic 10; Greece 10 Czech Republic 4; Poland 5 Russia 10; Czech Republic 6 Poland 10; Greece 6 Russia 10. Group B – Holland 10 Denmark 8; Germany 10 Portugal 5; Denmark 10 Portugal 4; Netherlands 4 Germany 10; Portugal 10 Netherlands 6; Denmark 10 Germany 8. Group C – Spain 10 Italy 4; Ireland 9 Croatia 10; Italy 10 Croatia 6; Spain 7 Ireland 10; Croatia 2 Spain 10; Italy 9 Ireland 10. Group D – France 10 England 8; Ukraine 8 Sweden 10; Ukraine 4 France 10; Sweden 7 England 10; England 7 Ukraine 10; Sweden 9 France 10. Quarter-Finals – Russia 6 Germany 10; Denmark 8 Poland 10; Ireland 10 Ukraine 7; France 10 Spain 8. Semi-finals: Germany 10 Ireland 8; Poland 3 France 10. 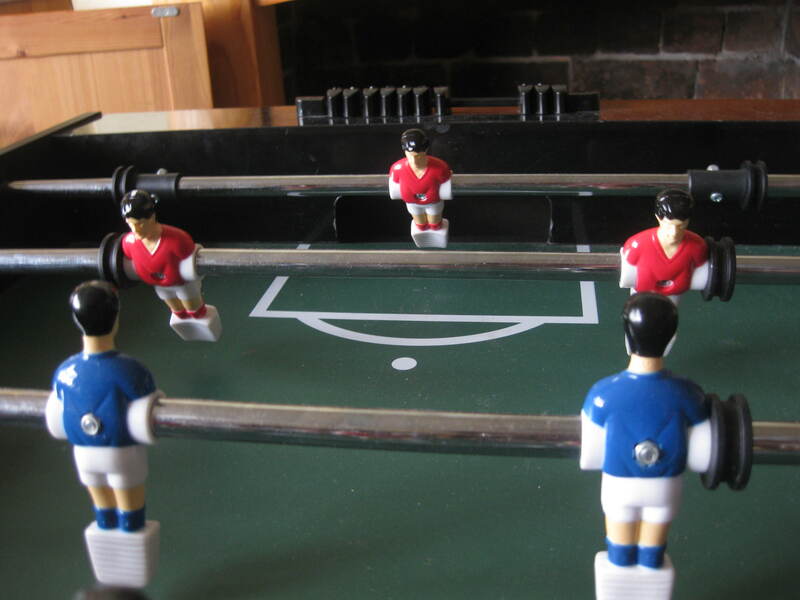 * You’ll only find coverage of the Yooro 2012 table football tournament final via https://writewyattuk.wordpress.com (I should imagine).